Australian natural gas consumers concerned about natural gas prices set to soar to $9 per gigajoule need to look carefully at the following table. The table here shows the results of converting any solid fuel (coal, crop residue, waste plastic, etc ...) with an energy content of 25 gigajoules per tonne into synthetic natural gas ("SNG") with a conversion efficiency of 80 percent. 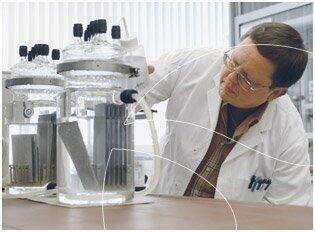 That is, converting each 100 gigajoules of solid fuel into 80 gigajoules of natural gas. "Gasification has been reliably used on a commercial scale for more than 75 years..." - Read more at the Gasification Technologies Council website. 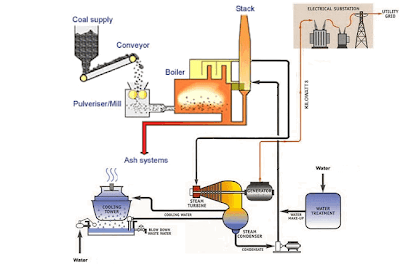 "... Countries have been building coal gasification plants for years. ..." - Read more at the World Coal Association website. SES is the provider of a highly efficient, cost effective, and commercially proven coal and biomass conversion technology based on the U-GAS® gasification technology that was developed over the last 40 years. The U-GAS® process was the result of a Department of Energy (DOE) and Gas Technology Institute (GTI) joint development program that began in the early 1970s to convert coal into synthetic natural gas during the first US energy crisis. 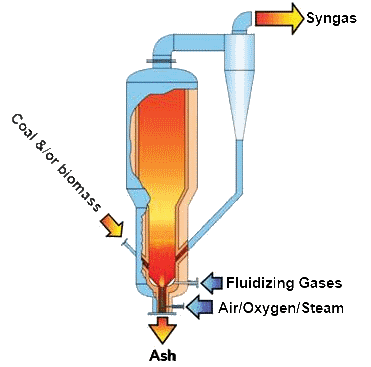 The U-GAS® gasification technology was piloted, demonstrated, and commercially operated on a wide range of feedstocks including bituminous coal, sub-bituminous coal, lignite, biomass, coal char and wastes, and metallurgical coke. Since SES has begun to commercially deploy the U-GAS® technology, we have advanced the technology through modifications to improve conversion, efficiency, and cost competitiveness through an expanding intellectual property estate. Our technology enables customers to realize higher project returns through greater fuel flexibility, higher efficiency, lower operating costs, and lower capital investment. Malcolm Maiden's article in The Age yesterday "Carbon switch won't stop price rise" says "Coal-fired power stations that have their capital cost fully depreciated can produce power here for less than $10 per megawatt hour". Coal mines in NSW are struggling to cover costs of production with export prices for thermal coal falling to $80 per tonne. A reasonably modern, efficient coal-fired power station buying coal at $80 a tonne has a fuel bill of about $20 per megawatt hour. Labour and maintenance would add more. Can Australian coal-fired power stations really afford to produce electricity at less than $10 per megawatt hour? Are renewable, natural gas and geothermal power generators disadvantaged by coal-fired power stations being sheltered from free-market forces? How much lower could an effective carbon price be if coal-fired power stations paid export-parity market prices for coal, just as natural gas power generators will be required to do when the Gladstone LNG facilities begin exporting next year. NSW electricity consumers may not have to wait much longer to learn the answer to this mystery of coal being supplied at taxpayer-subsidised prices to State-owned coal-fired power plants. "NSW power sale to hit energy prices"
Negotiations with Whitehaven coal for coal supply are in the price range of $55 to $66 per tonne, which is an increase of around 33% over the majority of current supply contracts. 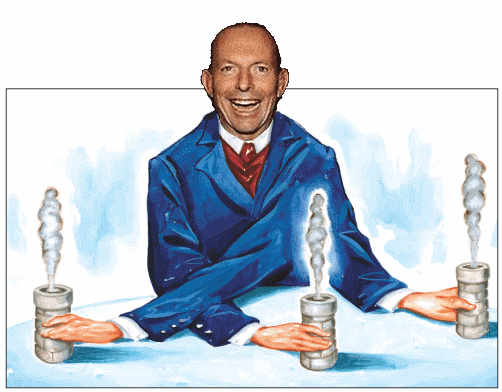 A carbon price per tonne of carbon dioxide must be an unfathomable enigma to Tony Abbott. How can carbon dioxide, if it is weightless as Tony Abbott believes, weigh even one gram, let alone a whole tonne? In a speech to the House of Representatives on 8 February 2010 Malcolm Turnbull said "an Australian emissions trading scheme, with a carbon price set by the market, would improve business investment certainty. Market-based approaches have the potential to deliver least-cost abatement by providing incentives for firms to reduce emissions where this is cheapest, while allowing the continuation of emissions where they are most costly to reduce. This ETS allows Australian businesses to make their own decisions as to how to reduce their emissions. Government sets the rules and, in particular, sets the cap on total emissions and then lets the market work out the most efficient and effective outcome. Schemes where bureaucrats and politicians pick technologies and winners, doling out billions of taxpayers’ dollars, neither are economically efficient nor will be environmentally effective. For those reasons, I will be voting in favour of this legislation." In February 2010 journalist Mark Schapiro wrote in Harper Magazine CONNING THE CLIMATE - Inside the Carbon-Trading Shell Game "Unlike traditional commodities, which sometimes during the course of their market exchange must be delivered to someone in physical form, the carbon market is based on the lack of delivery of an invisible substance to no one." On 26 February 2010, a few weeks after Malcolm Turnbull's speech to the House of Representatives, Tony Abbott addressed the Menzies Research Centre Policy Roundtable, saying: "Why should Australia be in a rush to establish a $15 billion a year market in the non-delivery of an invisible substance to no one?" "And I tell you what else the next Coalition Government will do, it will save Australia from an emissions trading scheme. It will save Australia from this great big new tax. It’s interesting, I don’t know how many of you read the Financial Review today, but I would encourage you if you do browse through that paper to look at the Review section behind the Market Wrap because there is a fascinating study about just how a carbon market might work, and if Mr Rudd has his way carbon will become the world’s most traded commodity – more traded than cars, more traded than coal, more traded than wheat, more traded than intellectual property and financial services and yet carbon, the stuff that Mr Rudd is so keen to turn into this extraordinary market, it’s about the non-delivery of something that’s invisible to no-one. That’s what his emissions trading scheme is about. It’s about the non-delivery of an invisible substance to no-one and he wants to turn this into a $15 billion a year market in Australia. I mean, really and truly. My original political mentor, B.A Santamaria, had a phrase. The phrase was “a moonbeam from the larger lunacy”, and what the Prime Minister wants to do is to create a $15 billion a year market that’s about the non-delivery of an invisible substance to no-one. David, I want to thank you and your colleagues here in the Queensland Chamber of Commerce and Industry for being amongst the first to alert people to the con job that was being foisted on the Australian public and I want to say that the people’s revolt that you helped to ignite is going to spread right around this country." JOHN LAWS: I don’t know. TONY ABBOTT: …I mean, how are we going to police these emissions? This carbon cop is going to be an extraordinarily intrusive instrumentality, running around trying to make sure that all these businesses aren’t actually emitting given that you can’t actually see, smell or touch what’s going on. It's just not fair for Tony Abbott to strain his brain trying to grapple with such imponderable and perplexing riddles. The Business on ABC TV reports today Queensland at the coalface of the mining slowdown. In Queensland the Bowen Basin is feeling the full force of a massive mining downturn that's reverberating through the economy. Australian coking coal producers hit by falling demand and who may be looking to a cut in a carbon tax to help them are in for a series of rude shocks. ULCOS - Ultra-low CO2 Steelmaking - is just one. ULCOS stands for Ultra–Low Carbon dioxide(CO2) Steelmaking. worldsteel has an important role in helping its members use each of these four building blocks and has a number of dedicated initiatives. worldsteel provides a forum where the various national and regional research and development programmes on identifying breakthrough technologies for steel manufacture can exchange information on their projects. These include the ULCOS programme funded by the European Commission and the European steel industry; the COURSE 50 research programmes in Japan; the US steel industry and US Department of Energy programmes; the POSCO programme in Korea and many others.